Cotswold Outdoor is proud to be our official outdoor retailer and they’ve shared some of their top tips to make your camping trip one to remember (for all the right reasons). Read on to ensure you’re not one of those people with all the gear but no idea. As well as checking there is ample room for everyone to sleep comfortably, you need to allow plenty of room for your gear, so a tent with a porch area is ideal. Remember to take some spare tent pegs and a roll of duct tape for emergency repairs. Along with a camping stove, pans and spare gas canisters, make sure you take enough plates and cutlery for everyone. ‘Sporks’ are great, as they triple-up as a fork, spoon and knife. Use frozen cartons of juice and milk as a space-saving alternative to freezer blocks. In the morning, everything in your coolbox will be fresh, ready for your hearty breakfast. Choose a sleeping bag which not only keeps you at a comfortable temperature, but allows you as much space to move around as you need. When selecting a sleeping mat or inflatable airbed, make sure it fits in the inner section of your tent, without touching the sides. Camping chairs come in all shapes and sizes, from basic folding seats to full luxurious loungers, complete with built-in pillows and footrests. Pick the one you like, sit back and relax. 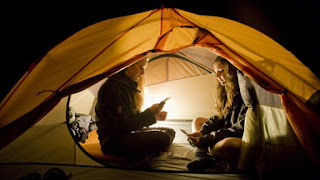 A camping trip is the perfect opportunity to get away from it all and make wonderful lasting memories with loved ones. Get active with a game of catch, an impromptu cricket match or a swingball tournament. Take a torch and a lamp so the fun can continue long after the sun has set, playing card games, board games or just reading your favourite novel. Going camping does not mean you have to ‘rough it’ completely. Far from it; most campsites have toilet blocks with shower facilities, so pack your washbag, a fluffy towel and don’t forget your toothbrush. It’s a good idea to take a simple first aid kit with you, plus insect repellant and sunscreen in the summer, so that you’re ready for anything. For light sleepers, an eye mask and ear plugs will help you slumber in peace for longer. For more hints and tips on camping, visit Cotswold Outdoor, where you’ll also enjoy 15% off everything with your National Trust membership*. So all you need to do is gather everyone together and get ready for your next adventure. *This is not to be used in conjunction with any other offer or discount. Selected lines are exempt. This offer is redeemable on production of your National Trust membership card in store or email partners@cotswoldoutdoor.com with your National Trust membership number to receive a discount code to use online. Offer expires 31.12.17.